Films screened for this group are held at the St Andrews Hall for mature audiences. In the event of a Total Fire Ban Day, with Fire Danger Rating (FDR) of SEVERE and above screenings will be cancelled and rescheduled. Members are requested to arrive at 7.30pm for an 8pm start. People can join at any time of the year, but, of course, the earlier the better! The evenings are casual and friendly. People bring a plate to share, and there is wine for $5 a glass, beer $4 a stubbie, soft drink to buy, and free tea and coffee. The hall is heated in winter and in the Summer we keep the doors open, covered with a curtain, and the ceiling fans work well. The stackable chairs are not padded, so we recommend bringing your own cushion. At the end of the evening, everyone does a bit to help pack up the hall ready for the market the next day. The program (shown below) is selected from a long list of about 60 titles that is mailed to the members in October. Everyone is invited to contribute to this list over the year. Members make their choices and return the sheets to the committee who make the final selection, keeping in mind the need for a good balance. Selections are subject to availability. 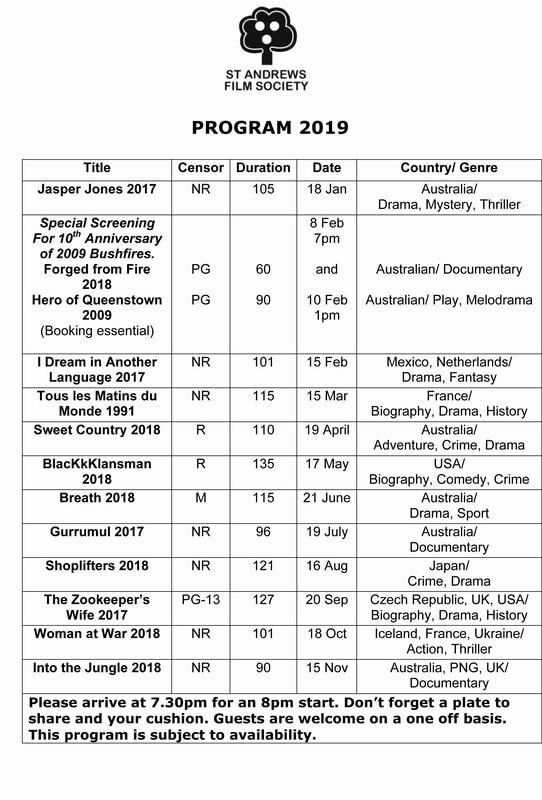 There is plenty of variety offered- Animation, Australian, Classic, Mainstream/wide release, Independent/limited release, Documentary, Musical, and World. To join the SAFS Friday Group – Membership forms are available here and at the St Andrews general store, or phone 9710 1368 or email patreynolds@internode.on.net or fill in the Enquiry Form on this site, and you will be contacted. If you are interested in seeing the long list votes for films for 2018 you can view them by clicking on the document below.